Agatha Christie is back in a sequel to the first book by Andrew Wilson (A Talent for Murder, 2017) which presented an alternative story to the reason for her amnesia episode back in the 1920s. 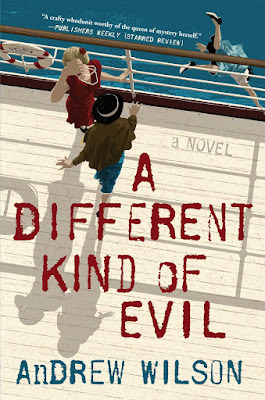 A Different Kind of Evil takes place only two months after that headline making event that brought Christie a bit of international notoriety and has repercussions in her latest adventure in crime solving. Also based on her vacation in the Grand Canary Islands taken in the February following the Harrowgate Incident this second novel allows her to become a legitimate sleuth and not a would-be murderer. Her intended escape to Paradise for rest and relaxation turns into a detour into a den of vice and haven for hellish violence. Fans of Christie's mystery novels who might have been disappointed with the lack of detective novel features in the previous book will have nothing to complain about in this book. There are plenty of dead bodies, lots of clues in a wonderful homage to traditional detective novel storytelling, all culminating in a mind-blowing finale that dares to thumb its nose at those traditions while at the same time delivering a satisfying and thrilling ending to the multiple mysteries. I hesitate to talk about the plot at all. And, in fact, I'm not going to. Imagine that! This is a book that is best read knowing as little as possible. I suggest you not read the plot blurb or any of the publicity related to it. Still, I cannot resist indulging in my knowledge of the Christie Canon by dropping a few hints for her diehard fans. Know that if you are among the cognoscenti who have read all her books and count among your favorites such prizewinners as Evil Under the Sun, Death on the Nile, Cards on the Table, Murder at Mesopotamia and Triangle at Rhodes there will be plenty for you to enjoy. I found elements of all of those books from a Salome Otterbourne clone in the person of the garrulous Mrs. Brendel to the feuding lovers Guy Trevelyan and Helen Hart who recall several similar couples in Christie's books. The inclusion of some Afro-Caribe occult rituals recall the voodoo business poor Linda Marshall got up to in Evil Under the Sun. Gerard Grenville, the occult master of Tenerife in A Different Kind of Evil and a standout creation among the intriguing cast, will remind Christie fans of many similar sinister types from Mr. Shaitana (Cards on the Table) to the creepy "witch" Thyrza Grey (The Pale Horse). None of these references are spoilers in any way, as they will be quite obvious nods to Christie's books by those well acquainted with them. Set in the Canary Islands on Tenerife and its surrounding villages and beaches A Different Kind of Evil includes absorbing detail on mythology, culture and religion of the islands. With two archeologists and one geologist in the cast of characters frequent discussions of those sciences allow Wilson to enhance an already colorful setting. Of particular interest and what made the book even more unique as a mystery novel were the background on the Guanches (the pre-colonial indigenous people of the Canary Islands), their practice of mummification and death rituals, the mythology related to the volcano Mount Teide, and some fascinating details on the demon figures known as Tibicenas. I doubt anyone will be familiar with any of those topics unless they are anthropologists or students of arcane mythology. Though Wilson's book is ingeniously clued in a manner very much in keeping with the Grand Dame's time honored methods of planting her clues as well as her skill in creating ample misdirection I very much doubt even the most astute readers will be able to outguess Wilson in his brilliant homage to Christie's life and work. With only a few sentimental indulgences when the story veers away from mystery to domesticity and motherhood in dealing with Agatha and her daughter Rosamund, Wilson keeps the focus on the many crimes plaguing Tenerife and its expatriate community. He succeeds in creating a pervading atmosphere of amorality and unnerving random violence when he sticks to his murder mystery plot. By far this is one of the most admirably performed and accomplished Christie pastiches in quite some time. Wilson matches Christie's talent in plot structure and mechanics, use of unusual characters, and multiple compellingly told mysteries in a book worthy of standing alongside any of the Grand Dame of Mystery's books. Now this sounds much more like my kind of thing -- thanks, John! The presmie of the first one struck me as a rather more Highsmithian tale, and I read my fill of Highsmith in my late teens/early 20s. However, give me Agatha Christie: Legitimate Detective and I'm all ears. I shall definitely make a note of this and check it our in due course. I think Wilson worked extra hard on this one to make up for the Highsmith flavor of his first book with Agatha. The allusions and sly references are abundant and the clues are very much like what you'd find in a Christie book. I'm curious what you will make of the over-the-top ending if you do decide to read it. I actually was laughing in astonishment. All in all I think this book is so much better than the first one. There's a lot at stake and you want the real villains to get what's coming to them. I have to say he pulled a really old plot trick (a favorite with both US and UK mystery writers even now) in this book and I stupidly fell for it where in other genuine Golden Age mystery novels I have seen through the trick almost immediately. So Kudos to Wilson for that. I'll keep an eye out for it at my library -- I rarely buy hardcovers these days, and I'm quite keen to give this a go -- and will get back to you when I've read it.